Today we are reviewing a product called Opus Health Phytoceramides. 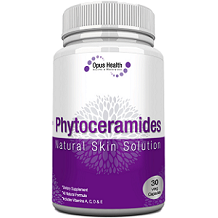 Phytoceramides are similar to a natural lipid found in our body called ceramides, which keeps our skin hydrated and firm. Phytoceramides are the plant-derived equivalent of this natural lipid. The manufacturer of this product claims that this supplement can replace ceramides that are lost as you age therefore reversing the process of wrinkles and aging. They also claim this product will help to keep your skin hydrated improve skin texture and general skin health. Vitamin A protects the collagen in the skin against damage caused by excessive UV radiation from sunlight. Vitamin C is necessary to create collagen. Vitamin D helps immature skin cells to mature and replace the damaged ones. Vitamin E is a powerful antioxidant that reduces inflammation, which can lead to wrinkly skin. 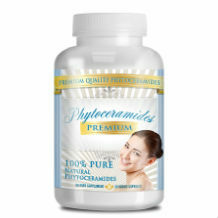 Phytoceramides have been shown to increase collagen, and hydrate the skin improving texture and general health. Take one capsule of Opus Health Phytoceramides per day. The manufacturer does not explain whether the supplement should be taken with meals, or when in the day it should be taken. On Amazon, one 30 capsule bottle costs a whopping $289.99. This is for a 30 day supply and represents the most expensive supplement we have ever reviewed. Shipping is extra, and there are no additional new customer incentives nor bulk buying discounts offered. We did not see any mention of side effects or warnings on the product description but you should consult with your physician before using this product especially if you are pregnant, nursing, taking any medicines, have an existing medical condition, or are under age 18. The manufacturer offers a short 30 day money back guarantee, but details are not provided, and it is unclear if you can return an opened bottle of capsules. Among the encouraging aspects of this product are that its ingredients are backed by scientific research and might provide some benefits to your skin health. The dosage is quite simple and easy to follow. There is 30 day guarantee policy provided by the manufacturer. Less positive aspects of this product are that although there is a guarantee, it is short at 30 days, and lacks details. It is unclear if you can return opened bottles of capsules. It seems shipping is an extra cost. There is no first time customer incentive nor bulk buying option. Regarding dosage instructions, the manufacturer does not explain whether the supplement should be taken with meals, or when in the day it should be taken. Saving the worst for last – this is hands down the highest priced supplement that we have ever reviewed at $289.99 for 30 capsules. That’s almost $10 per capsule!!! With a price like this it definitely should have a much stronger guarantee. Needless to say, we strongly recommend you look for a more affordable supplement that has bulk buying discounts, a longer return policy and guarantee that allows return of opened bottles of capsules, and free shipping.